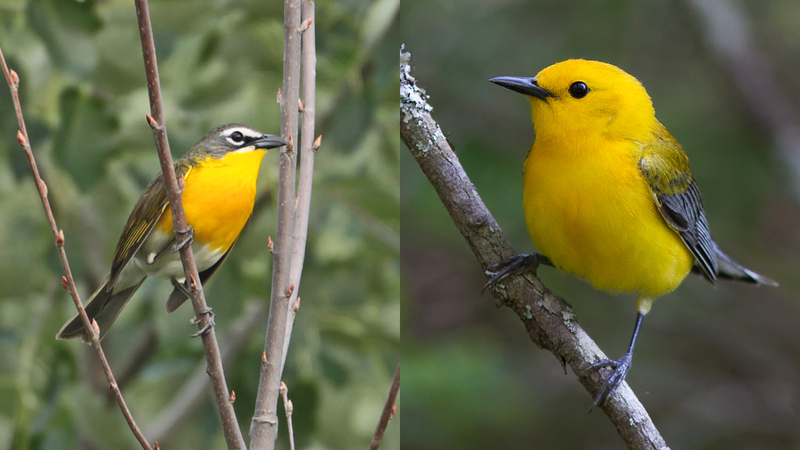 The yellow-breasted chat (left) and prothonotary warbler (right) thrive in different habitats. Meeting bioenergy goals means making trade-offs about which wildlife species -- like these -- will be most impacted. Photo credit: U.S. Fish & Wildlife Service. Images retrieved via Flickr and shared under a Creative Commons license. New research from North Carolina State University and the U.S. Geological Survey (USGS) finds that choosing how to meet bioenergy goals means making trade-offs about which wildlife species and ecosystems will be most impacted. The work focuses on the southeastern United States, but yields general insights that could inform bioenergy policy globally. “Bioenergy can refer to wood pellets burned to generate electricity or to liquid biofuels, and bioenergy sources range from crops like switchgrass and sweet sorghum to cultivated pine forests and natural pine and hardwood forests,” says Nathan Tarr, lead author of one paper on the work. “There are questions about how renewable energy targets that promote bioenergy may affect wildlife habitat and forest ecosystems. 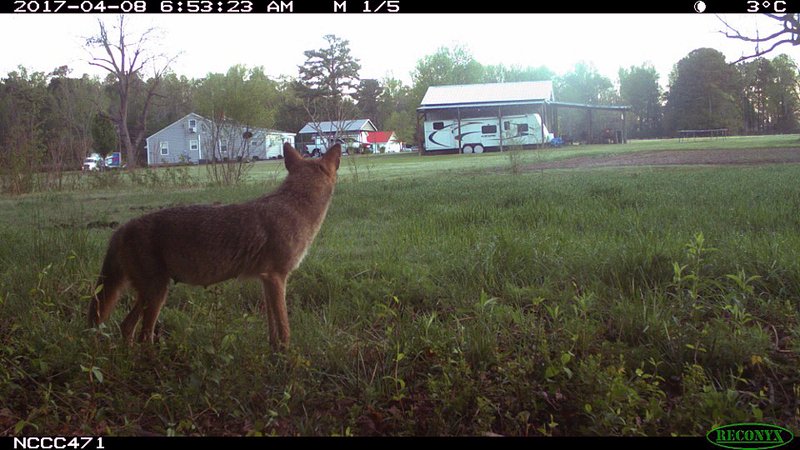 We wanted to better understand the potential impacts of bioenergy demand in North Carolina and, by extension, in the Southeast and beyond.” Tarr is a research associate in the North Carolina Cooperative Fish and Wildlife Research Unit at NC State. To address these questions, the researchers first developed models that allowed them to translate bioenergy demand into projections of changes in the size and characteristics of ecosystems. The researchers found that the specific mix of biomass sources used to meet demand could play a significant role in shaping ecosystems, especially in forests that contain high biodiversity. “Each of the biomass sources we looked at caused substantial land use change, especially in the coastal plain region, which is known for its high biodiversity and was recently designated a global biodiversity hotspot,” Costanza says. The researchers then used the projected forest changes to model habitat gains and losses for 16 wildlife species.- They were also able to assess what the use of different biomass sources might mean for various wildlife species. The researchers found that realistic levels of bioenergy demand are large enough to cause large gains or losses of habitat for some species, and the specific mix of biomass sources used to meet demand resulted in tradeoffs regarding wildlife habitats. “None of the biomass sources that we looked at were good or bad for all species, nor was a single mix of biomass sources consistently the best or worst for all species,” Tarr says. Species with small ranges deserve special consideration because they can be more sensitive to landscape changes related to bioenergy harvesting. The papers, “Projected Gains and Losses of Wildlife Habitat from Bioenergy Induced Landscape Change” and “Bioenergy Production and Forest Landscape Change in the Southeastern United States” are published in the journal Global Change Biology Bioenergy. 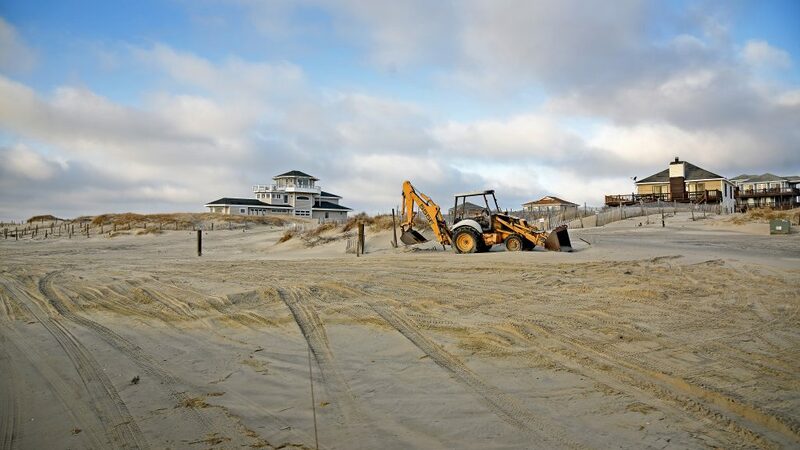 Both papers were co-authored by Robert Abt of NC State; Jaime Collazo of the USGS and the North Carolina Cooperative Fish and Wildlife Research Unit; and Alexa McKerrow of USGS. The work was done with support from the USGS Gap Analysis Program. Abstract: Domestic and foreign renewable energy targets and financial incentives have increased demand for woody biomass and bioenergy in the southeastern United States. This demand is expected to be met through purpose-grown agricultural bioenergy crops, short-rotation tree plantations, thinning and harvest of planted and natural forests, and forest harvest residues. With results from a forest economics model, spatially explicit state-and-transition simulation models, and species-habitat models, we projected change in habitat amount for 16 wildlife species caused by meeting a renewable fuel target and expected demand for wood pellets in North Carolina USA. We projected changes over 40 years under a baseline “business-as-usual” scenario without bioenergy production and five scenarios with unique feedstock portfolios. Bioenergy demand had potential to influence trends in habitat availability for some species in our study area. We found variation in impacts among species, and no scenario was the “best” or “worst” across all species. Our models projected that shrub associated species would gain habitat under some scenarios because of increases in the amount of regenerating forests on the landscape, while species restricted to mature forests would lose habitat. Some forest species could also lose habitat from the conversion of forests on marginal soils to purpose-grown feedstocks. The conversion of agricultural lands on marginal soils to purpose-grown feedstocks increased habitat losses for one species with strong-associations to pasture, which is being lost to urbanization in our study region. Our results indicate that landscape-scale impacts on wildlife habitat will vary among species and depend upon the bioenergy feedstock portfolio. Therefore, decisions about bioenergy and wildlife will likely involve tradeoffs among wildlife species, and the choice of focal species is likely to affect the results of landscape-scale assessments. We offer general principals to consider when crafting lists of focal species for bioenergy impact assessments at the landscape scale. Abstract: Production of woody biomass for bioenergy, whether wood pellets or liquid biofuels, has the potential to cause substantial landscape change and concomitant effects on forest ecosystems, but the landscape effects of alternative production scenarios have not been fully assessed. We simulated landscape change from 2010-2050 under five scenarios of woody biomass production for wood pellets and liquid biofuels in North Carolina, in the southeastern U.S., a region that is a substantial producer of wood biomass for bioenergy and contains high biodiversity. Modeled scenarios varied biomass feedstocks, incorporating harvest of “conventional” forests, which include naturally-regenerating as well as planted forests that exist on the landscape even without bioenergy production, as well as purpose-grown woody crops grown on marginal lands. Results reveal tradeoffs among scenarios in terms of overall forest area and the characteristics of the remaining forest in 2050. Meeting demand for biomass from conventional forests resulted in more total forest land compared with a baseline, business-as-usual scenario. However, the remaining forest was composed of more intensively managed forest and less of the bottomland hardwood and longleaf pine habitats that support biodiversity. Converting marginal forest to purpose-grown crops reduced forest area, but the remaining forest contained more of the critical habitats for biodiversity. Conversion of marginal agricultural lands to purpose-grown crops resulted in smaller differences from the baseline scenario in terms of forest area and the characteristics of remaining forest habitats. Each scenario affected the dominant type of land-use change in some regions, especially in the coastal plain which harbors high levels of biodiversity. Our results demonstrate the complex landscape effects of alternative bioenergy scenarios, highlight that the regions most likely to be affected by bioenergy production are also critical for biodiversity, and point to the challenges associated with evaluating bioenergy sustainability.